Airport Shuttles and Transportation in Cabo San Lucas, Mexico. Airport Shuttles and Private Transportation from San José del Cabo International Airport (SJD). We can also arrange Avis car rentals for our villa and resort clients. Free airport-to-private villa transfers for CaboVillas.com guests! When book one of our villas, you'll be met at the airport by our representative who will transport you to your villa rental for check-in. If you've reserved a car rental through us, we'll deliver your vehicle to your villa at no extra cost. Complimentary Van or Suburban airport-to-villa transfer (up to 10 guests) is available for initial Los Cabos guest arrival only (first group to arrive). 3-night min. stay required. Guests arriving at a later time must reserve alternate transportation. Free transfers and rental car delivery only available for Los Cabos villa reservations and car rentals reserved through us. Complimentary transfers available for private villa rentals in Los Cabos; not available for villa units on resort properties. For La Paz area guests, contact your Cabo Specialist for check-in procedures. Upgrade to round trip and larger vehicle available, contact us for details. Note: Wheelchair-accessible van available for additional charge (accommodates 6 passengers total). Call us for details. Suburban or Toyota. Two pieces of regular-size luggage per person. Priced per person. Note: Shuttle transportation not eligible for all resorts. Ask your Cabo Specialist for more details. Prices are round trip per person. Half price for one way arrival transfers only. Children 3 and under without a car seat are free. Children with car seat and/or children 4-8 years old are 50% off. Car seats are available for rental: $5 each way. For shuttles to Cabo San Lucas, there may be up to four stops before arriving at resort. For shuttles to San José del Cabo or Corridor, there may be up to two stops before arrival at resort. Prices to or from Los Cabos International Airport. Priced per vehicle. 30 Min. consecutive stop (Toyota Van, Suburban, Ford Transit) - $31.50. Note: If a stop at a specific store/retail outlet is desired, this request must be made at least 72 hours in advance due to local transportation ordinances regulating tourism transportation. If not requested with required advance notice, a stop may still take place. However, drivers will stop at a comparable shop at their sole discretion. 24-hour notice required for transfers from airport to villa/resort. 72-hour notice required for transfers from villa/resort to airport. Includes baggage handling at airport, bottle of water upon arrival, beer (1 per person) during transfer, and tax. Private transportation available for executive jet arrivals at Cabo San Lucas small craft airstrip from $80 for drop-off in Cabo San Lucas, from $100 for Corridor and from $115 for San Jose del Cabo. Please contact us for quote. Note: 72 hour advance booking required. Client must have airport transportation through Transcabo in order to have transportation to activities. Note: Five-day advance booking and full itinerary required. Shuttle transfers are for CaboVillas.com customers only. Prices do not include a recommended gratuity of 15%. To guarantee availability, all transportation should be reserved at least 7 days in advance. Car seats are available at $5 per seat each way (limited inventory). 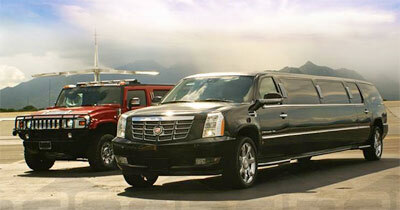 Golden Nugget limousines offers exceptional vehicles for your luxury transportation needs in Los Cabos. Their outstanding fleet includes stretch Hummers and Escalades for a stylish ride during your vacation getaway in Cabo San Lucas. Their outstanding vehicles and professional service will make your Cabo outing unforgettable! ©1994 - Present • Earth, Sea and Sky Vacations Inc.